I don't know why but I have always been scared of trying this dish out. Too many options out there, and I was not sure about flavors and what to use. I have been dying to have a good ramen bowl though, so I got over it and tried a few different options and this one came out a winner!!!! Mix the olive oil and miso paste until dissolved, toss with the brussels sprouts. On a large baking sheet spread the sprouts in an even layer and roast fro 20-25 minutes. Place a large soup pot over medium heat and add the sesame oil, ginger and garlic. Cook 30 seconds and then slowly add in the broth. Add the mushrooms, soy sauce and bring the soup to a boil. Add the chicken and carrots and then simmer for 10 minutes until chicken is cooked through. Remove the chicken from the soup and add the spinach. Cut the chicken and put it back in the soup along with the ramen noodle. Cook until the ramen is just soft, about 2 minutes. 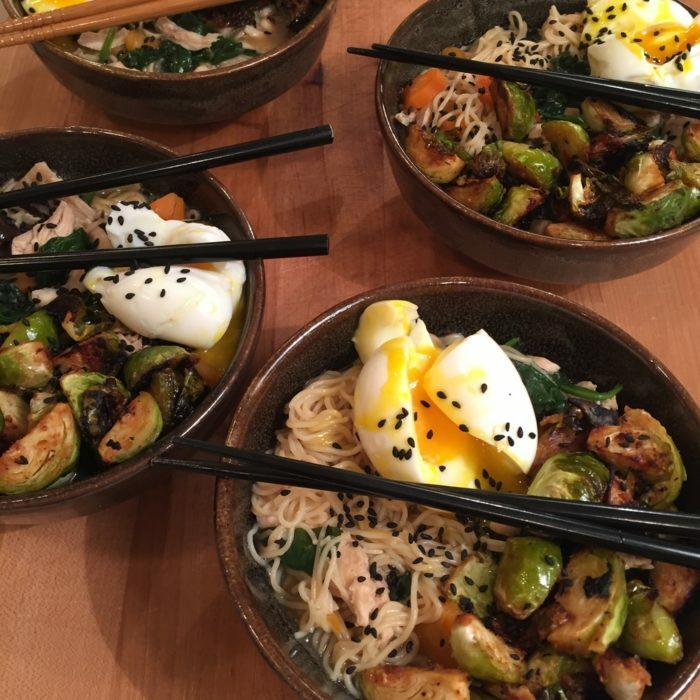 Divide the soup among the bowls, top with soft boiled eggs, add the brussels sprouts and sprinkle the sesame seeds.